Want to enjoy an all-inclusive vacation for under $200 in Mexico for under $200? Call us today to book one of these gorgeous all-inclusive properties in the Riviera Maya, Cancun, Tulum Los Cabos, or Puerto Vallarta! Read on for more details and base pricing information. 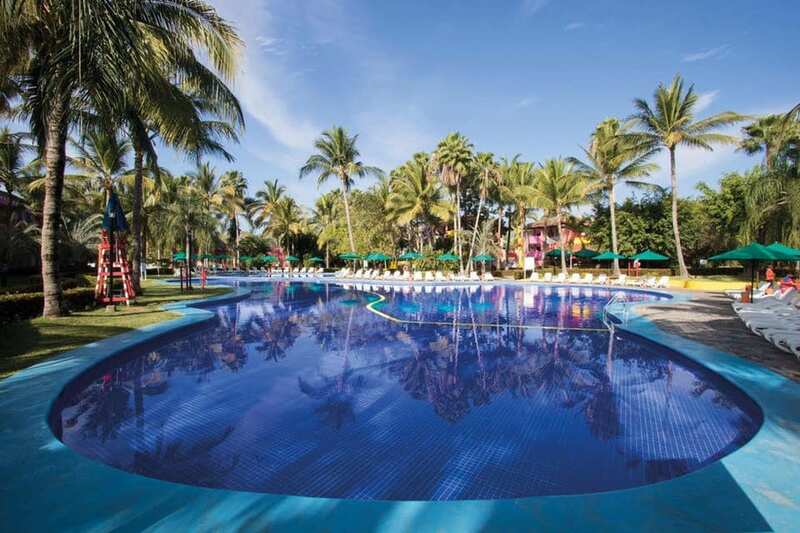 Surrounded by tropical gardens, fragrant flowers and shady palm trees within the Playacar Resort complex, this lively resort in Mexico is ideal for families, in addition to active travelers, on a budget. Just a short drive from the shops and restaurants of 5th Avenue, this property offers the perfect blend of sun and fun with sparkling swimming pools, a kid’s activities club and playground, a spa and fitness center, 24-hour all inclusive snacks and beverages, a wide selection of restaurants and bars, a disco, water sports and traditional guestrooms complete with a private balcony, minibar and liquor dispenser. As an added bonus, guests also enjoy access to all facilities, activities and entertainment at the nearby Riu Yucatan and Riu Playacar. You can stay here starting at $182/night for 2 adults. 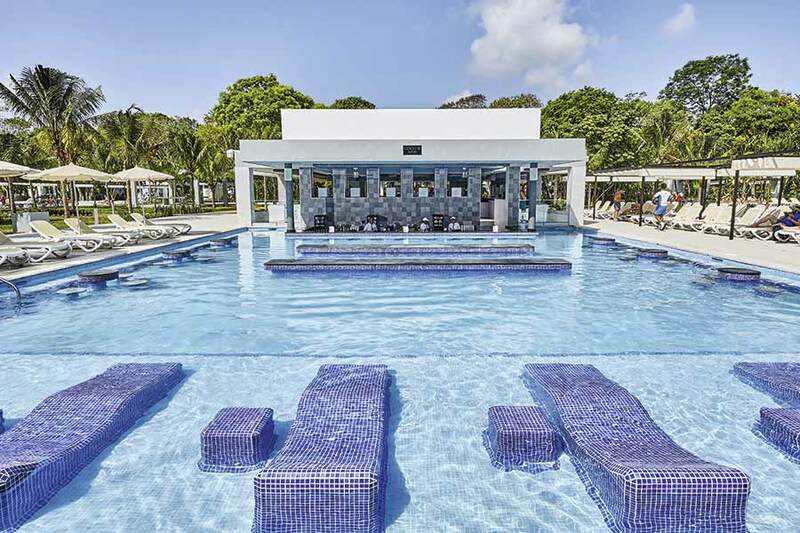 Riu Lupita offers affordable luxury for those traveling to the Riviera Maya in Mexico. In addition, this property offers a quaint, quiet atmosphere. It’s 300 suites are spread out among several buildings that look like little houses. You’ll feel like you’ve escaped to a luxurious Mexican village when you stay here! In addition, the food here is very good with lots of options, including Italian, American, Mexican and more. 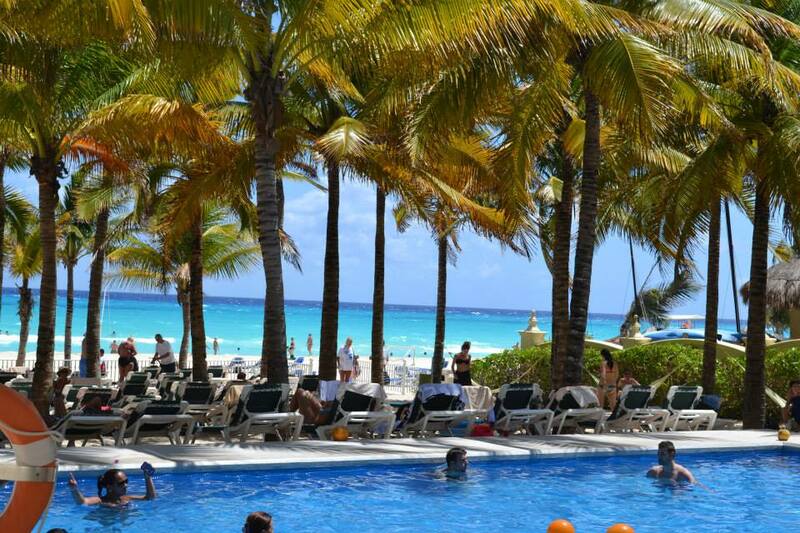 The beach is gorgeous here and dotted with mature palm trees for an authentic old-Mexico feel that you will love. You can stay here starting at $190/night for 2 adults. This Mexican Paradise in Akumal offers something new for those that want to venture away from the hotel zone of Cancun and the Riviera Maya. 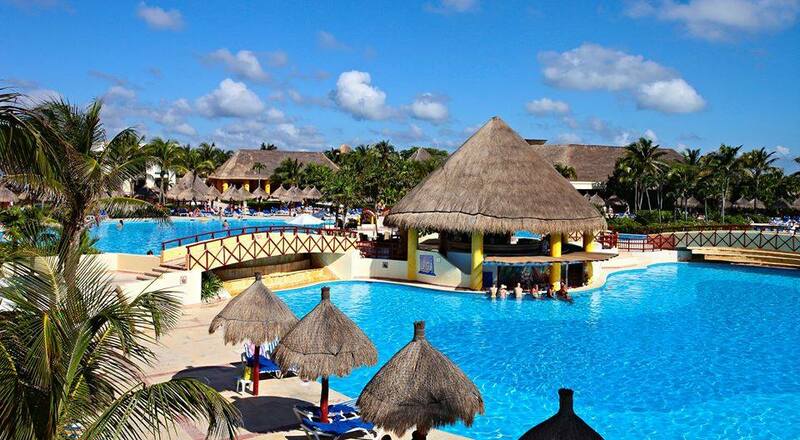 The complex is actually host to three properties: Grand Bahia Principe Tulum, Akumal and Coba. The Tulum and Akumal properties both have beach access, and the Coba resort is set more into the jungle. No matter which of the three you choose, you can easily get around the resort as trolley cars cruise the properties every 10 minutes and you have access to all 3 resorts. It is well set up and gives the feel of a mini-community when you stay here. You can stay here starting at $198/night for adults. 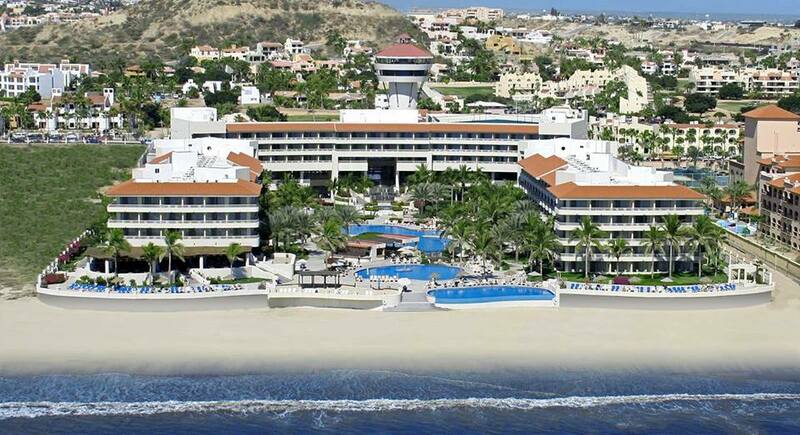 Nestled between white sandy beaches of San José Del Cabo and the Sierra de San Lázaro Mountains, the Holiday Inn Resort Los Cabos All-Inclusive Hotel is one with its tropical environment. Ideal for any type of vacation, the property offers three different ambiances: A quiet adult-only section perfect as a relaxing hide away, an activities section with a big pool where scheduled games and activities take place during the day, and a family section with pool and a special kids playground to get together with your children to have fun in the sun. In addition, you’ll find great food and amazing service. You can stay here starting at $163/night for 2 adults. 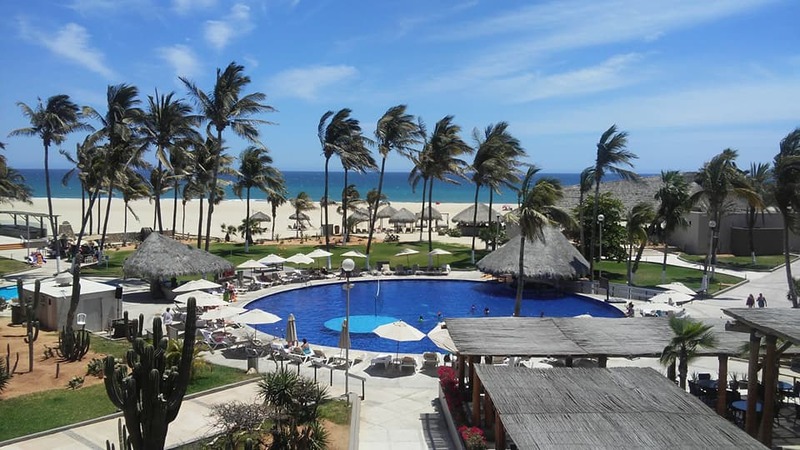 Located in San Jose del Cabo, Bracelo Gran Faro is perfect for families. The destination is prime because it’s not smack dab in the middle of Cabo, but outside of town. This means you and your brood can relax in the tropical splendor of Baja – walk on the beach, do the water sports thing, bask in the glow of the magical sunsets and more. But if you want a little more action, you all can hit the main marina town or take a boat trip to El Arco. You can stay here starting at $189/night for adults. 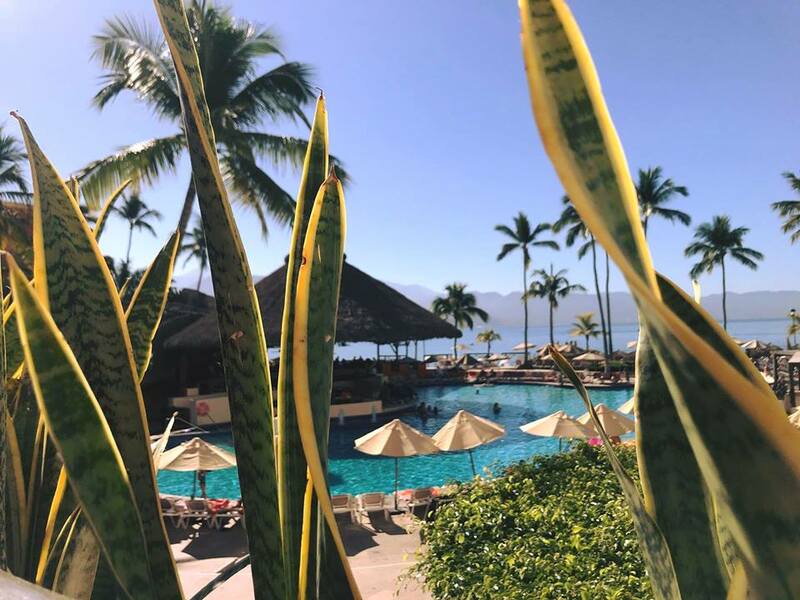 With a colonial Mexican style paired with the natural beauty of the mountains, Krystal Puerto Vallarta emerges on eight acres at the border of the golden coast of the Mexican Pacific Ocean. The resort is graced with cobblestone paths, aqueducts, tropical gardens, pools and more than 30 fountains. This is a great option for families as they offer spacious family rooms. It is also a great option for honeymooners on a budget, with romantic private suites. No matter what room you stay in at Krystal Vallarta, you’ll be greeted with outstanding service and a variety of activities. You can stay here starting at $149/night for 2 adults. Sunscape Puerto Vallarta Resort Unlimited offers stunning views of Banderas Bay. This new-ish resort opened it’s doors in 2016. 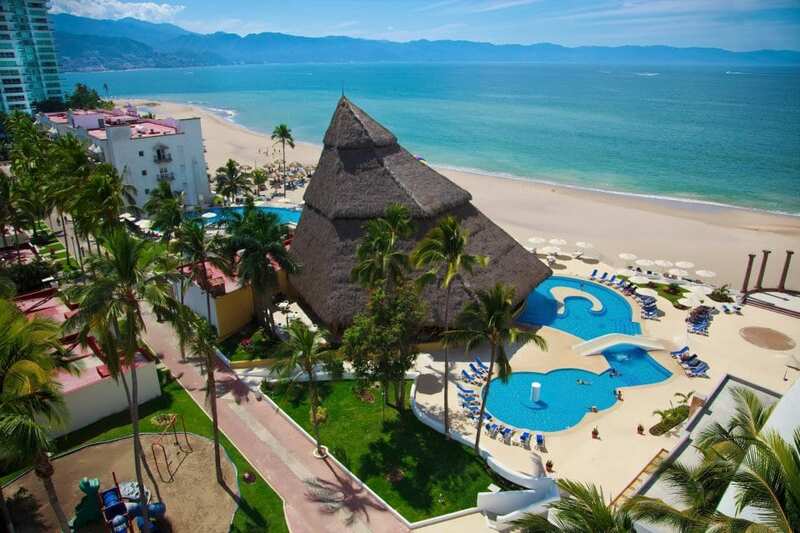 This is one of the best family-friendly properties in Puerto Vallarta, with a great family-friendly program. This program begins right at check-in, with a kid’s check-in experience featuring red carpet stairs, welcome treats and resort passports for kids. They also have the Explorer’s Club for kids 3 to 12. Adults will love the 24-hour access to food and beverage, including kid-friendly menu options, and the great dining options on the property. You can stay here starting at $157/night for 2 adults. Lastly, the Royal Decameron Complex is located in Riviera Nayarit, just 10 minutes north of the Puerto Vallarta International Airport. This is a wonderful option for singles or families who want to stay on property for the entirety of their stay, as Riviera Nayarit is more remote. However, with plenty of activities and an expansive property with tons of pools, beaches, and more, you’ll never get bored! Finally, this colorful property is a no-frills option for travelers that just want to have some good family fun. You can stay here starting at $162/night for 2 adults. Call us today in order to get your free custom quote. You can reach us at 402-390-9291. In addition, you can get started here and one of our Mexico travel specialists will get back to you.